OL7 The English Lakes – South-Eastern Area. Click the PDF logo above to give a printable version of this walk without the photos. 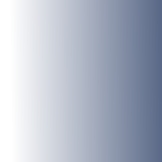 To view route as a dynamic Ordnance Survey map click here. Introduction: Visits to the Lake District are always something of a weather lottery. After all, there are Lakes for a reason! However, quite often when it is raining the proverbial cats and dogs in the heart of the Lake District, towards the Cumbrian coast, the weather can be glorious. 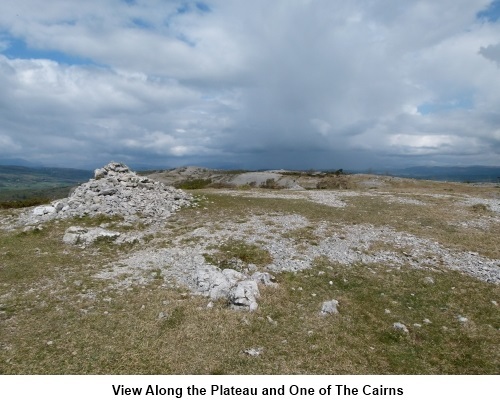 It was one such day when I wanted a walk near Kendal (where I was staying) and decided to explore the secret plateau of Whitbarrow. I say “secret” because you will not find this route from studying an Ordnance Survey map as not all the paths to access and cross it are shown. However they are most definitely there on the ground to those in the know (which now includes you!) and walkers are welcome. 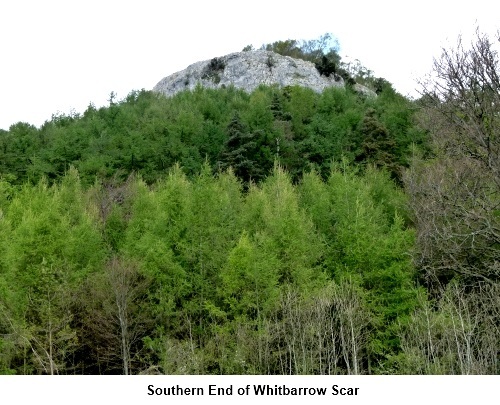 Whitbarrow (which means white hill) is a limestone plateau which looks like an escapee from the Yorkshire Dales. 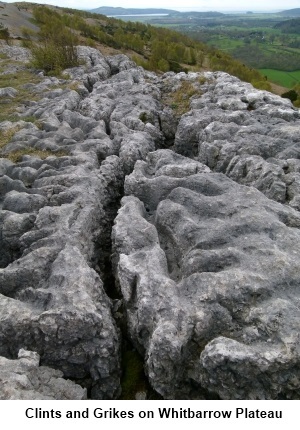 There are even sections of limestone pavement with its “clints” (limestone blocks) and “grikes” (fissures) which would be more at home at Malham. It is an area of Special Scientific Interest and part of it is a nature reserve. 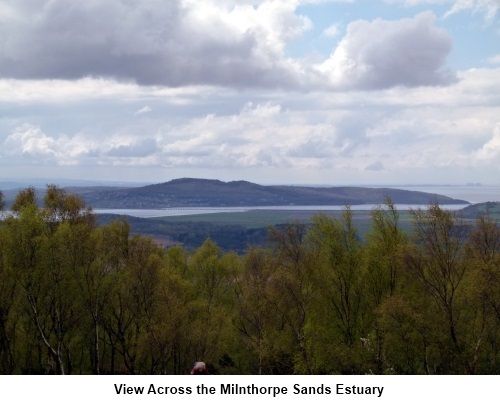 There are good views of the coastal estuary over Milnthorpe Sands and the Lake District hills. Its summit is known as Lord’s Seat. The terrain of the walk is straightforward and the amber traffic light is only earned because of the steep descent down the Bell Rake path although this under ½ mile. 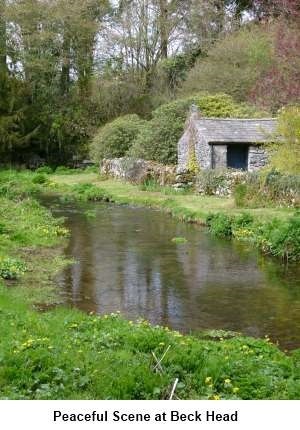 The walk starts from the hamlet of Mill Side. To get there, turn northwest off the A590, between the A591 and Grange-over-Sands, where signposted for Mill Side and Beck Head. There is a rough roadside lay-by on the right immediately after crossing what would have been the old main road. There are no refreshment opportunities during the walk, although there are some excellent vantage points where sandwiches can be enjoyed. 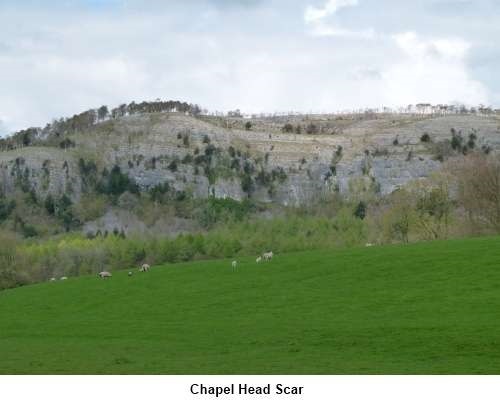 Afterwards, there is the Hiker’s Rest cafe at Beck Head (if open) or the Derby Inn at the nearby hamlet of Witherslack (just off the A591) is worth a look. Start: From the parking spot (SD 452840), walk up the lane towards Beck Head. After 200 yards, turn right through a gateway on to a broad stony track for Low Fell End. There is a public footpath finger post (SD 450841). At the farm, pass to the right of the farmhouse and go through the farmyard. At three metal gates, go through the middle one and proceed along the broad track with hedges at each side. As the track swings right into a field, bear left to a gateway ahead with a yellow footpath arrow. The path starts to climb through the trees. On meeting a broad track, turn right. Leave the broad track by the gateway to Whitbarrow Cottage and continue straight ahead along the narrow path. Good views over the estuary start to appear. The next turn is a little difficult to spot but about ¼ mile after passing the cottage, look out on the left for a footpath climbing steeply through the trees (SD 457849). It leaves the path you are on between some small rocks at the side of the path. On meeting a clearer track at a ‘T’ junction (SD 456849), turn left. 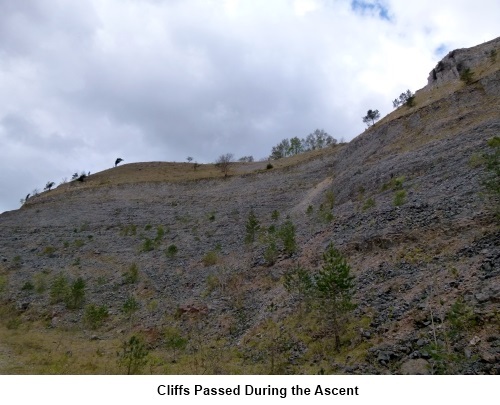 The path opens out beneath some impressive cliffs and crosses exposed bedrock, before returning into the woods through a fence. About 100 yards beyond the fence, turn right on to a track by an old bench (SD 454847). A white footpath arrow indicates the route although this is not obvious from the direction in which you approach. Go through a dilapidated wall then almost immediately turn right through a walkers’ gate back through the same wall. Stay on the same path as it meanders up through the trees until it comes out on to the plateau. It then swings round to the left along the broad ridge of the plateau. The OS map does show a plantation to the north east of the plateau ridge but this has been felled. The path along the ridge is obvious and passes a number of cairns. 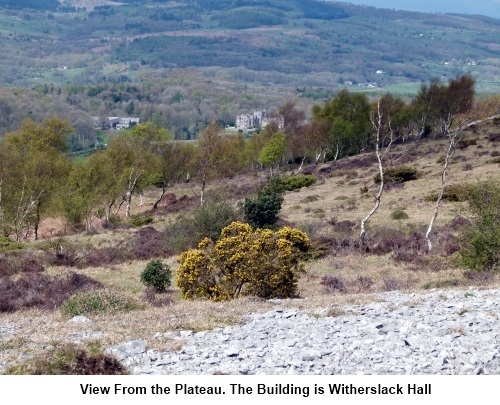 The impressive building in the valley to the left is Witherslack Hall, built in the 1870s and now a school. 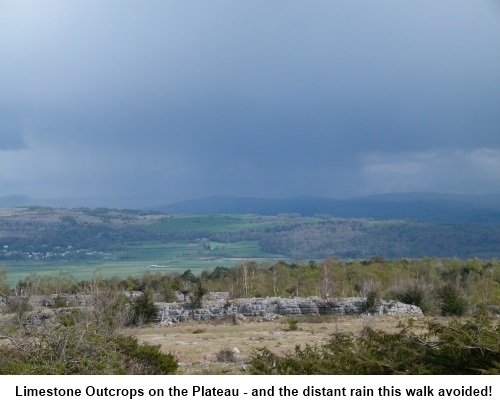 When a stone wall crosses your path, go through the stone stile into the Whitbarrow Nature Reserve and Site of Special Scientific Interest. Cross and ignore a faint path running NE to SW (SD 442872) (you may not notice this). 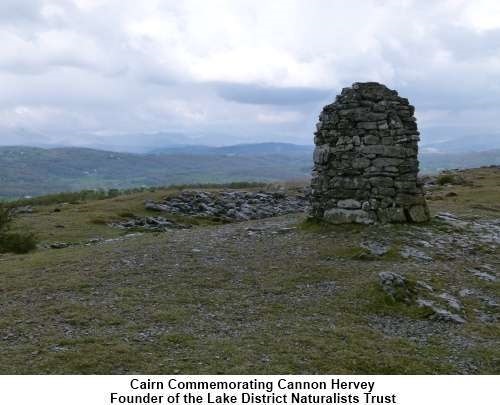 You also pass a large stone cairn commemorating Cannon Hervey 1893 to 1967, founder of the Lake District Naturalists Trust. At a clear fork in the path, go left. Eventually, the path approaches a stone wall then runs parallel with it. If you see a stone stile through it, ignore this. The path starts to gently descend until your way is blocked by a wall with a ladder stile (SD 441879). Do not cross this but instead, turn left to follow the wall, now on your right. Ignore a stone step stile. The path passes an old mine shaft on the left then starts to steeply descend a shale path down Bell Rake, going through a walkers’ gate in a stone wall. As the path levels out, come to a threeway finger post (SD 435877) and turn left for “Permitted Footpath to Witherslack Hall”. 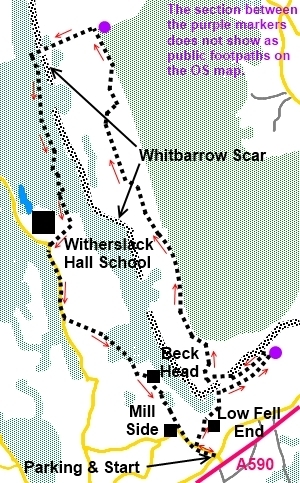 The route is sporadically marked with white arrows. Follow the main broad track through the trees for a short distance and look out for a narrow footpath off to the left. Follow this path through the trees. As you exit the trees, go through the kissing gate ahead and follow the track as it swings round to the right. At the road by the entrance to the school (SD 437859), turn left. Walk along the road for just less than ½ mile then turn left on to a broad public bridleway with a fingerpost for “Beck Head” (SD 438853). Follow this to Beck Head where there is a little cafe – the Hiker’s Rest – where you might get refreshment if open. The bridleway becomes a tarmac road. At the junction, turn left back to the car.